The Georgia Wildlife Federation has been a leader in the Georgia Water Coalition since the coalition began in 2002. Ongoing activities include providing a dedicated staff member, Gina Rogers, to serve as the Director of Operations for the Coalition, serving on the GWC’s Leadership and Legislative Teams, developing the GWC’s Biennial Report of Recommendations, facilitating and hosting membership meetings and Leadership Team retreats, and advocating for clean plentiful water during each Georgia legislative session. 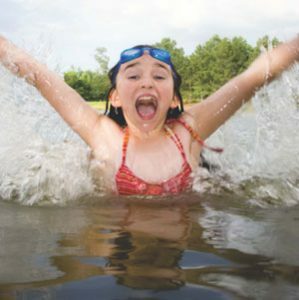 Donate to GWF and Support Programs like the Georgia Water Coalition. 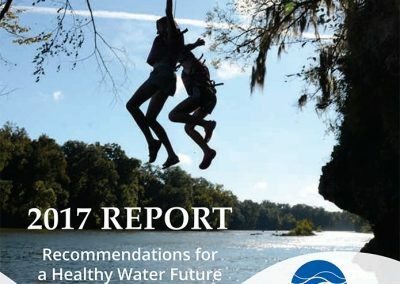 The Georgia Water Coalition is committed to protecting and caring for Georgia’s surface water and groundwater resources. If your environmental group, church, university, homeowner association, hunting and fishing club, or other civic organization is interested in joining, visit www.gawater.org. Capitol Conservation Day is an annual opportunity for all Georgians to gather at the Capitol to tell our state representatives and senators that we value water for our families, economy, health, and future generations. Learn more at www.gawater.org. 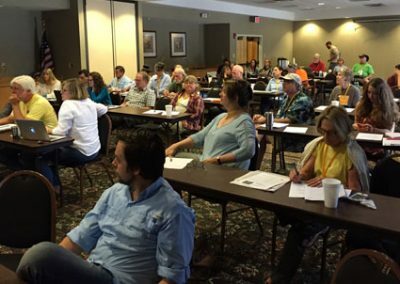 Georgia Wildlife Federation facilitates and often hosts GWC partner meetings throughout the year. For details on upcoming meetings, visit www.gawater.org. Georgia Water Coalition’s Mission is to protect and care for Georgia’s surface water and groundwater resources, which are essential for sustaining economic prosperity, providing clean and abundant drinking water, preserving diverse aquatic habitats for wildlife and recreation, strengthening property values, and protecting the quality of life for current and future generations. For more information, contact Gina Rogers, Director of Operations, Georgia Water Coalition. 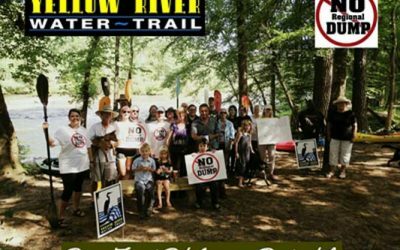 The Georgia Water Coalition was formed in 2002 in response to an initiative to privatize water in Georgia. 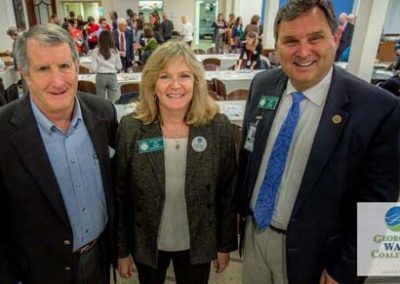 The Georgia Wildlife Federation was a founding member along with Southern Environmental Law Center, Georgia Conservancy, and Upper Chattahoochee Riverkeeper. 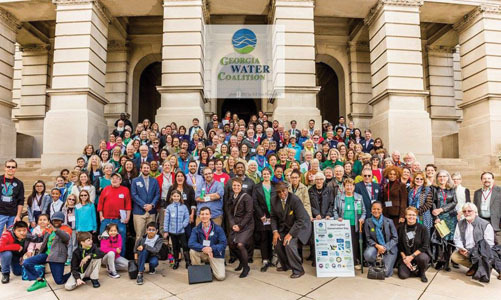 The Coalition grew and quickly became statewide advocates for Georgia’s water resources. GWC’s first major success came in 2003 with the defeat of legislation which would have allowed for water permit trading and privatization of our state water resources. 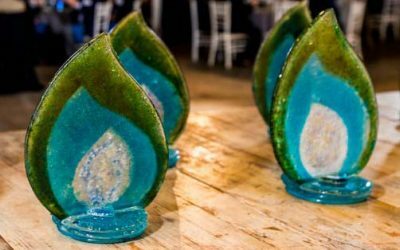 Sixteen years later, the Georgia Water Coalition (GWC) is an even more formidable voice for Georgia’s water with over 250 partner organizations from around the state and the southeast. Conservation leaders and local citizens learn more about grassroots advocacy during the spring Georgia Water Coalition partner meeting held at Little Ocmulgee State Park & Lodge in McRae, GA. 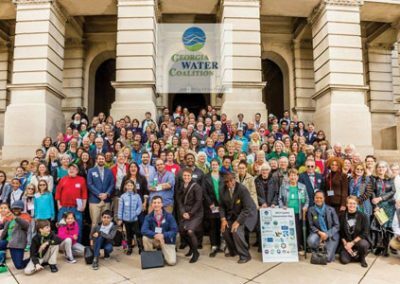 In February, organizations from all over the state gathered together to advocate for clean water at Capitol Conservation Day. 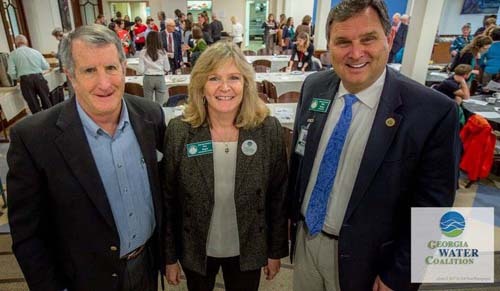 GWF District Director Tom Jones, Conservation Issues Coordinator Gina Rogers, and GWF President Mike Worley represent GWF at Capitol Conservation Day in February. 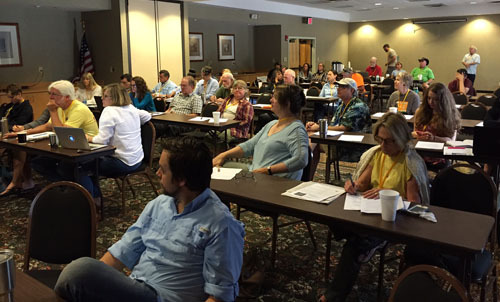 Georgia Wildlife Federation facilitates the development of the GWC’s Biennial Reports. 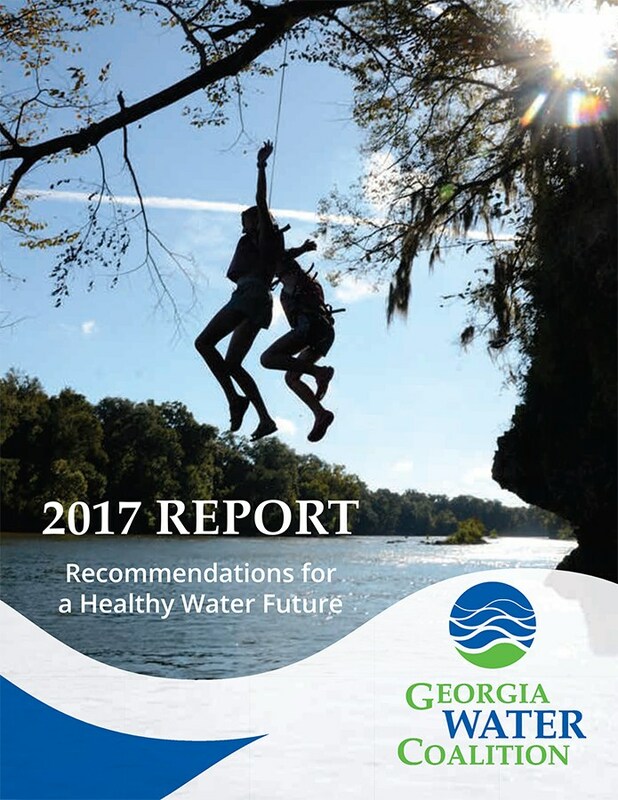 These reports are used to convey water management recommendations to Georgia’s leaders and elected officials. Georgia Wildlife Federation® is a nonprofit, member-supported 501(c)(3) organization. Join or Donate. Promoting the wise use of Georgia's natural resources since 1936. Copyright © 2018 Georgia Wildlife Federation. All Rights Reserved.